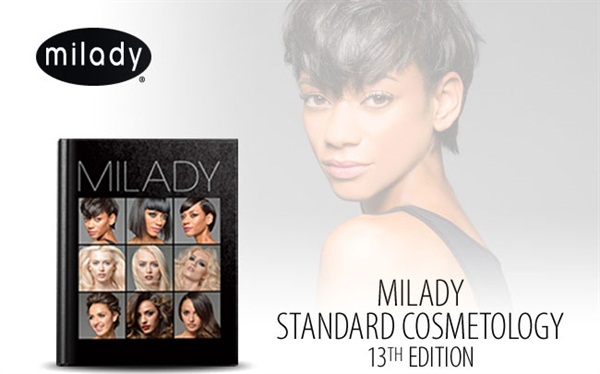 Milady announces the latest edition of Milady Standard Cosmetology, the most commonly used resource in cosmetology education. Milady announces the latest edition of Milady Standard Cosmetology, the most commonly used resource in cosmetology education. The textbook features a brand new design and layout with more than 750 new photos to provide a visually compelling resource for today’s instructors and students. Some of the key features of the new edition are learning objectives listed at the start of each chapter, a phonetic pronunciation guide for difficult terms at the end of chapter glossaries, left hand procedures, and web resources. There are also many new updates, including a thoroughly revised section on infection control to ensure students follow the latest health and safety standards to protect themselves and their clients, as well as adhere to state and federal regulations. Digital resources and other materials for instructors, including a Course Management Guide and Instructor Support Slides on CD, are available separately, providing an innovative and user-friendly experience. Study guides and test preparation materials are also available separately for students. To hear from some of the authors, made up of top professionals and educators in the industry, who worked on the new edition, watch this video. Attention school accounts! If you haven’t already received your copy of this newest edition, click here to request one. Click here to subscribe to the Nail School Newsletter!